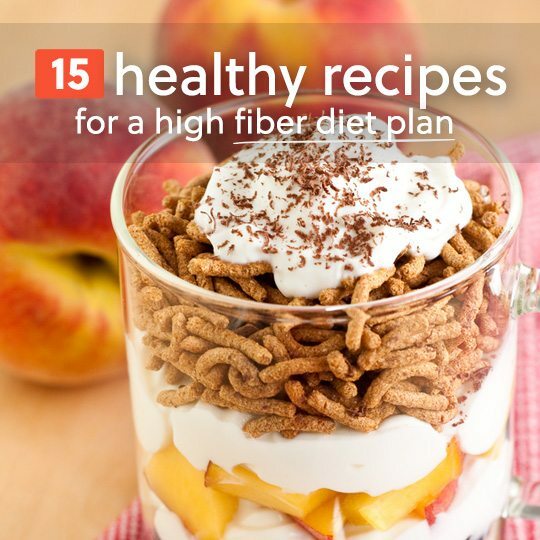 When you’re looking to lose weight and feel great it pays to stick to a high fiber diet. 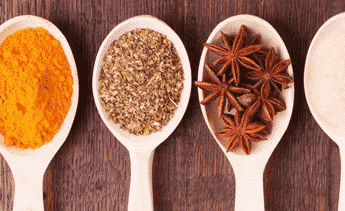 These recipes will fill you up and help your digestive system run smoothly. Not only that but they taste great and are something you’ll look forward to, a far cry from most high-fiber foods you’ll find in stores. 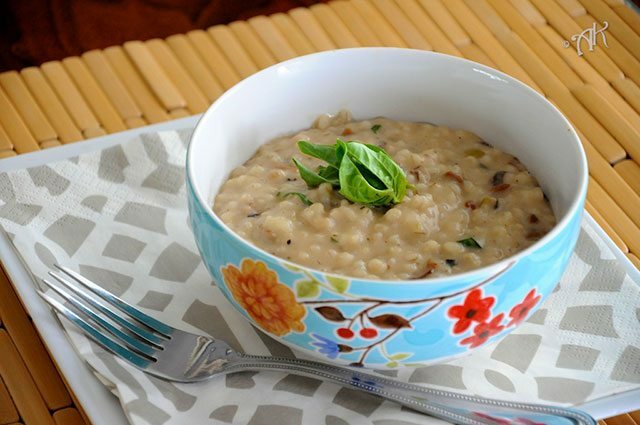 Barley is a good source of fiber, and does a really good job of keeping you satisfied long after the meal is finished. Making it into a risotto is no small feat, but Abby has pulled it off nicely. Combining it with mushrooms adds more fiber to the meal, and basil is an antioxidant-rich herb that lends its classic flavor to the dish. This could be eaten as a light lunch, or as a side dish at dinner. With 10 grams of fiber per serving you’re looking at taking a big chunk out of your daily fiber requirement, and in a very tasty way. These tacos are absolutely delicious, and they don’t use any meat at all. You’re getting the delectable taste of roasted vegetables mixed with black beans, and served on corn tortillas. Each element of these tacos is full of fiber, from the sweet potatoes, to the black beans, and even the corn in the tortillas. There are Ro-Tel tomatoes used in it, so it’s going to have a bit of a cook, but the avocado does a good job of cooling things off while supplying its signature healthy fats, potassium, and even more fiber. This is a hearty soup that will definitely do a good job of hitting the spot, while giving you a good amount of fiber. There is an entire head of cauliflower in this soup, which gives it its creaminess but also 3 grams of fiber added to each serving all by itself. Adding to that you’ve got carrots, turnips, celery, and edamame. The edamame alone adds another 2 grams of fiber to the soup. This means you’re getting 5 grams of fiber plus the cumulative fiber from the other vegetables. This is a soup you won’t soon forget, and there’s a strong chance you’ll be making it more than once. Lentils are an excellent source of fiber, and they make a great stuffing choice for these peppers. Each green pepper brings with it 2 grams of fiber, which will definitely contribute to your overall totals for the day, but isn’t epic by any means. 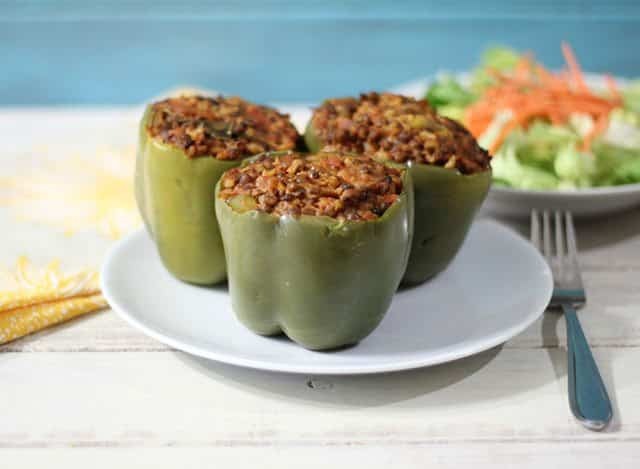 The lentils on the other hand provide 8 grams of fiber in each pepper, so you’re getting a minimum of 10 grams of fiber in each stuffed pepper. If you’re trying to get the daily recommendation of 32 grams of fiber, you’ve got nearly a third of it from just one stuffed pepper. Surely you can get the other two thirds from your remaining meals for the day. A veggie wrap with a crunch is what’s promised here, and this recipe delivers. Each ingredient provides you with some fiber, and the sum is greater than the whole of its parts. You’ve got whole grain wraps which gets the fiber ball rolling in a big way, added to that there’s green and red bell peppers, avocado, and hummus, all of which bring a respectable amount of fiber. The crunch is supplied by sunflower seeds, which in addition to healthy fats and protein provide additional fiber. With all that’s going on in these veggie wraps you won’t even miss the meat if you’re a meat eater. Chickpeas are full of fiber, but all too often they’re not cooked properly and can be a bit bland. Most of the time they’re eaten as a hummus with added ingredients like garlic and pepper to make it taste better. Here they’ve maintained their original form, and are baked up with Creole seasoning so they’re spicy, and crunchy, and yummy. If you ate a cup of these – not recommended – you’d likely have your full day’s worth of fiber covered. So stick to a handful and you’ve got a big bite of your daily requirement covered. Black beans are a tasty form of fiber, and the same can be said for sweet potatoes. Put them together and you’ve got a winner when it comes to a delicious high-fiber meal. 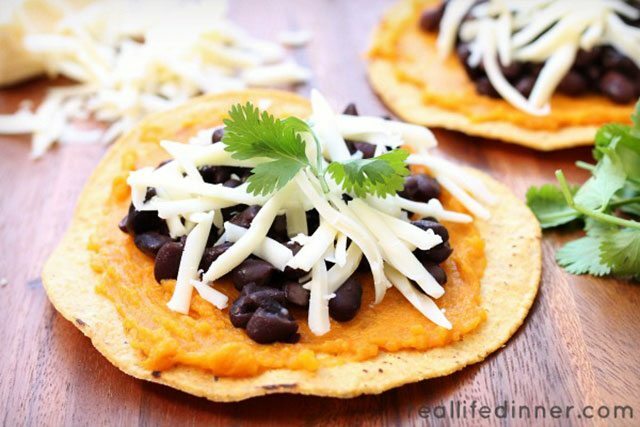 You can go a step further and make sure that your tostada shells are made from whole grains, but as it stands this is a crunchy way to enjoy your fiber rather than make it feel like it’s something you’re forced to eat. Fiber got a bad reputation thanks to all of the bland and boring bran muffins and fiber cereals, but it can really be an enjoyable experience when you do it right. 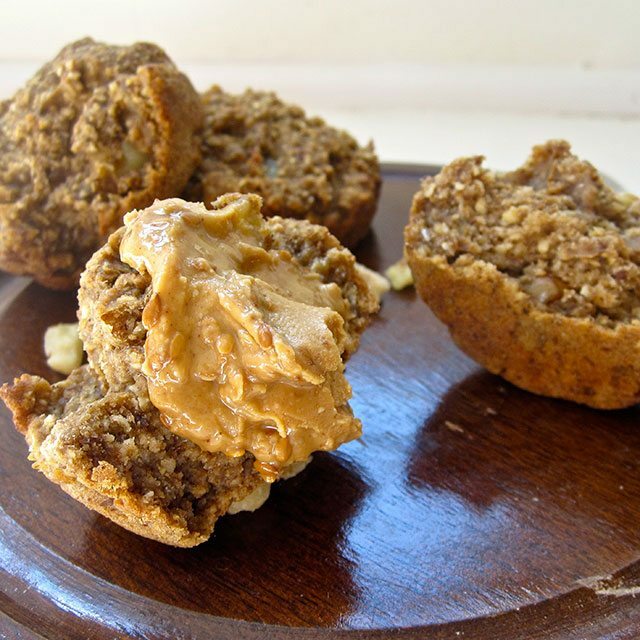 Here’s a way to get some fiber into your system while feeling like you’re having a treat. They say peanut butter and chocolate is a great combination, and this chocolate peanut butter is no exception. She’s using dark chocolate, which provides you with antioxidants and is something many health experts recommend eating regularly. It’s added to all natural peanut butter which is where the fiber comes from. Some coconut oil and stevia extract make it taste even better, and you’ll love spreading it on all sorts of foods. Whole grain crackers or toast would be two delicious options that have even more fiber in them. Broccoli is such an excellent source of fiber, vitamins, and minerals that you should eat it often. The only problem is that you have to keep it interesting so you don’t get sick of it. This is one broccoli recipe to keep in your collection because it makes it taste so good you’ll actually seek it out on a regular basis. It’s a bit on the spicy side, not because of the red bell peppers which don’t add any heat, but because of the use of sriracha. If you don’t like your broccoli spicy simply cut back on the sriracha, or cut it out entirely. You can eat your cake, and have your fiber too! 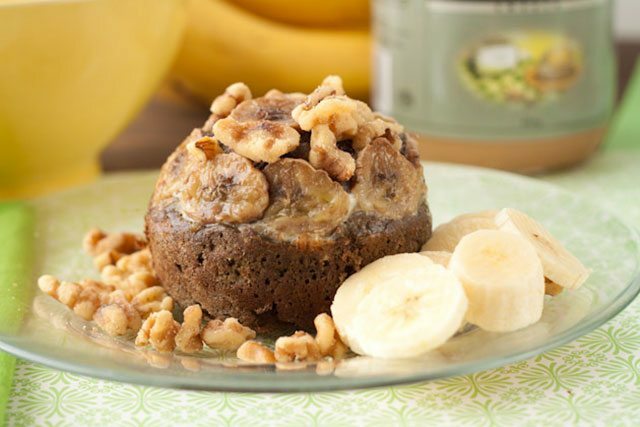 This banana bread is made grain, and provides fiber through the banana and walnuts. There is also protein powder added which makes this a surprisingly satisfying cake that provides plenty of flavor with no sugar crash later. There’s more fiber than you’ll generally find in a banana bread, and we like that this makes a single serving cake that’s just perfect for those times when it’s just you and you want something that can be eaten as a dessert and won’t derail all of your healthy eating progress. This is an example of how you can take a meal that wouldn’t have much in the way of fiber, and turn it into a high-fiber recipe with just one extra item added. Although pineapple has some fiber, the amount of pineapple in each serving doesn’t come to much, and there’s no fiber at all in the chicken. But by placing this over a bed of black beans you’re getting a lot of fiber, as well as minerals, some extra protein, and a carbohydrate that helps to balance out the protein from the chicken. This is a meal that not only tastes great, but will keep you satisfied for several hours. This is the sort of surprise that you’ll like getting! It’s a breakfast bake that has apples on the inside, not coconuts. Suprise! The coconut is actually used in the form of coconut flour, which makes sure this breakfast bake comes out light and crispy. With the addition of coconut oil and coconut sugar there’s definitely a coconut theme going on here. You can add in any other fruit filling you want with these, so you can customize it to your own personal taste, or the collective taste of your family. Try these cakes once and you’ll definitely bake them up again. They’re full of good-for-you ingredients like dates, pumpkin puree, and flax, but the end result is a tasty cake. You may be tempted to make them only during the fall months when pumpkins take the spotlight, but they can really be enjoyed year round. The three aforementioned ingredients are also good sources of fiber, even though you wouldn’t know it by the way they taste. This makes these Paleo cakes something special, and you can make up a batch and eat from it all week long. The white beans in this recipe provide enough fiber to make it qualify as a high-fiber dish, but there’s also spinach which really boosts the total fiber number. You end up with just over 6 grams of fiber per serving, which may not sound like much, but it’s nearly a fifth of what you need from just one serving. A serving and a half will net you 9 grams of fiber and that bumps it up to about a third. The shrimp and feta cheese aren’t adding to the fiber equation, but they make this taste so good, and helps balance the meal so well. Black beluga lentils are something you simply must try if you’re a fan of lentils, and even if you’re new to the whole lentil scene. They have a distinct look to them, and you might mistake them for caviar if you didn’t know better. They have the same sort of fiber and protein as other varieties of lentils, which makes this salad a high-fiber option that is every bit as delicious as it is eye-catching. This is a gluten-free salad we think you’ll enjoy and with the baby portobellos you’ll have all the flavor you can handle.